Review “Red Bud” (Signal Ensemble Theatre): Playful to Toxic in 70 Minutes! Signal Ensemble Theatre presents the U.S. Premiere of RED BUD. 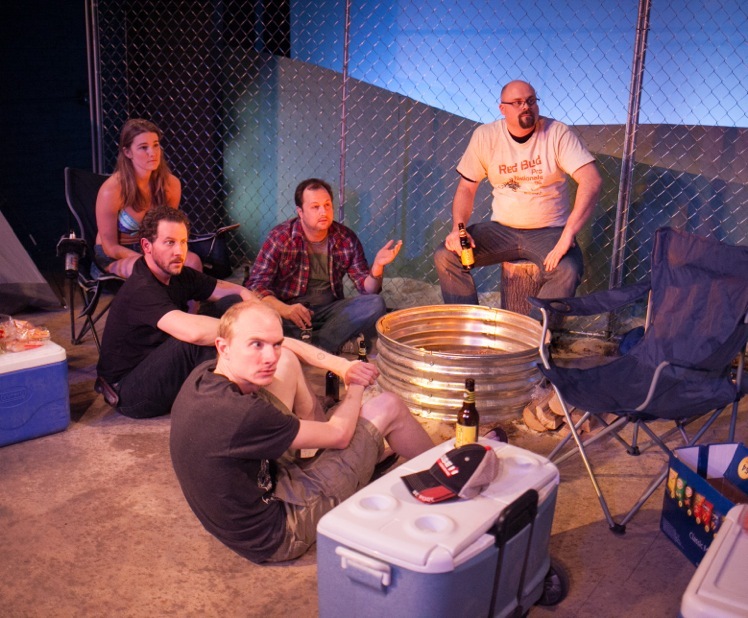 Playwright Brett Neveu captures perfectly what’s good and awful with annual male rituals. In his ode to the Midwest, Neveu has his guys gather for Red Bud, a championship motorcross race. The show starts off slowly as camp is set up. Each of the men arrives belting out a warrior-worthy ‘Red Bud.’ And each shout gets an echo response from a distant gathering. Anyone having experienced jamborees involving motorcycles, cars, trucks or even football tailgaters will smirk at this familiar mob excitement. Testosterone is fueling the fun at precarious levels. And once all the buddies are present the party accelerates from playful to toxic in seventy minutes flat. Neveu uses casual banter to illustrate the depth of these relationships. The short-cut exchanges show us these guys have history. To keep the authenticity of the booze-soaked brotherhood, Neveu doesn’t introduce his characters with long-winded discourse. He splices their backstory into little reveals in the conversations. “I’ll sleep in my truck.” “I’m dating a nineteen year old.” “I sold my bike.” The disappointment behind the simple statement is simmering just below the surface. Every guy has issues that he is drinking through. No one is talking about what’s really going on. Instead, they spiritedly start a drinking game that turns volatile. Director Brant Russell builds the intensity with unexpected speed. Russell gives the beginning of the play an almost unrehearsed sluggishness. Colby Sellers (Jason) is goofy. Joseph Stearns (Bill) is distracted. Bries Vannon (Shane) is caustic. It’s uncomfortably awkward as these guys force their traditional gathering. As their evening unfolds, Russell gives us glimpses of the stories behind the characters’ flaws. Joe McCauley (Greg) dismisses Sarah Gitenstein (Jen) with an annoyed look or veiled jab. His anger increasingly mounts as the Jack Daniels dangerously decreases. The commanding McCauley owns the last fifteen minutes of the show as he unforgettably mars his friendships forever. Russell skillfully pulls us into this authentic Red Bud world. His talented crew become these people at the motorcross roads of life. We begin to understand each individual’s reality compared to the collective dreams of the group over the years. The regret is palpable. And just when we are commiserating with the fellas over a beer, Russell throws gasoline on the campfire. RED BUD is what happens when the bromance is over. For more reviews and information on Chicago theatre, visit Theater in Chicago.